After a thoroughly unimpressive season opener at Houston that involved a bevvy or turnovers and lacked an offensive touchdown, the Miami Dolphins exploded in their 2012 Sun Life Stadium debut in Week 2 with a sound 35-13 victory over the helpless Oakland Raiders. It was truly a tail of two halves in this one, as Carson Palmer surpassed 200 yards passing in the first half and the Raiders entered the third quarter with a 13-10 lead. It was all Dolphins in the second half, however, as they controlled the ball on the ground, tightened up on defense and won the field position battle. Ryan Tannehill certainly didn't light things up in this one, but I thought he played pretty well nonetheless. He played mistake-free football after last week's turnover-fest and did a much better job evading pressure and going through his reads. And, of course, he ended up with his first two career touchdowns (one rushing, one throwing) in an overall solid performance. Reggie Bush stole the show today with a tremendous 172-yard performance on the ground while adding 25 more yards through the air. He should excellent vision and balance while turning on the jets we all know he has at just the right times. He and Lamar Miller got some great blocking today and they really took advantage. I thought the rookie too had a very good day and should earn more playing time even if Daniel Thomas (concussion) returns soon. 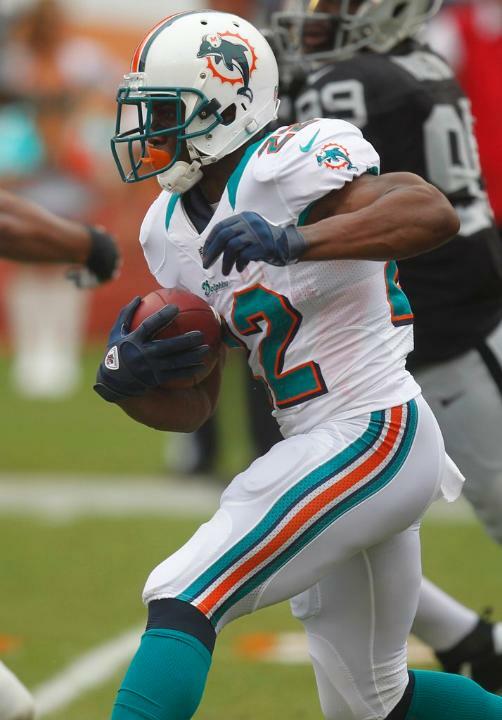 If Bush was the Dolphins' player of the game today, wide receiver Brian Hartline was easily the runner-up. 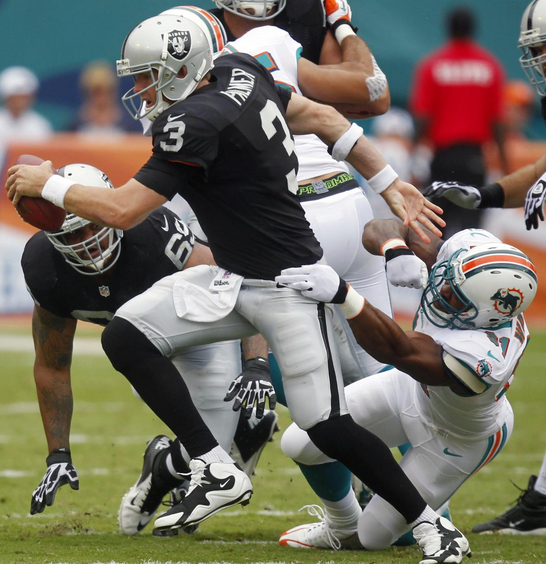 Hartline shredded the Raiders' secondary on comeback after comeback to the tune of nine catches for 111 yards. He showed tremendous rapport with Tannehill despite missing the entire preseason due to injury and is emerging as the Dolphins' clear-cut best receiver, as many of us expected. I swear, the guy makes at least one fantastic diving/toe-tapping catch every week. Jake Long had an uncharacteristically bad first half and was dominated by Matt Shaughnessy at times. You have to wonder if he's still a little dinged up, and if so, hopefully he's able to recover while playing. He was much better in the second half, though, and dominated in the running game. The rest of the offensive line did a nice job run blocking as well, especially in the second half. Mike Pouncey is playing some great football right now and Jonathan Martin rebounded from a weak debut and weak first half (at one point I swear he was sitting down trying to block) to help the Dolphins' offense move the ball. It'd be absolutely fantastic if the offensive line could come together and develop as a unit, because it looked to be a major work-in-progress before the season. Through two games, Cameron Wake has four tackles and zero sacks, but the truth is he's having a very strong season thus far. I swear Wake was held 47 times today and the referees seemed to miss all of them. The guy is a beast and unfortunately he's the team's only real pass rusher, so it's hard for him to do it alone. Still, as good as he's playing, the sacks will surely come. I feel like a broken record here, but Randy Starks and Paul Soliai both had great games today. Starks is so good at getting leverage and pushing into the backfield, while Soliai has simply gotten so good at clogging the middle and making stops. I was content to let Soliai walk in the offseason with the switch to the 4-3, but I am so glad the team kept him, and on a fairly bargain deal. Karlos Dansby led the team in tackles, but I thought it was a very weak showing for the Dolphins' well-paid middle linebacker. He made a few nice plays in coverage but was also exposed a few times as well. A few of his low-lights included taking a terrible angle and showing a lack of anticipation on Mike Goodson's 64-yard touchdown and whiffing on a tackle that could have resulted in a safety. (Sorry Karlos, but an actual Hall of Famer makes that play.) Combine that with a childish move in which he ripped he ball out of an official's arms after the play and I've just completely had enough of the guy. The secondary had an up-and-down day, but really tightened up in the second half. This was particularly true for Sean Smith, who got beat a few times early but didn't give up much in the last two quarters. The Dolphins did lose Richard Marshall to a back injury, though, and will be awfully thin at corner if he can't go next week. I will say though that I was pleasantly surprised with how Nolan Carroll and Jimmy Wilson held up in coverage. Chris Clemons was late getting to the ball a few times and once again got dinged up. On the other hand, I thought Reshad Jones played pretty well and made a nice play on an interception for the Dolphins' first turnover of 2012. Dan Carpenter had an easy day today, converting all five extra points and turning his only would-be field goal attempt into a nice little pooch punt. Meanwhile, Brandon Fields was excellent again with four of his six punts landing inside the 20 and a long of 59 yards. If he somehow managed to poison the Raiders' Shane Lechler while he was in Miami, Fields will have a shot at being the AFC's punter in the Pro Bowl. Marcus Thigpen averaged 14 yards on five punt returns, which is more than acceptable. I also felt he was a couple good blocks away from breaking one or two even longer. I found it interesting that the team seems to use Davone Bess in certain situations when the punt is deep in Miami territory, so perhaps they value his sure hands/decision-making in those situations. There's certainly a lot to like about this win for the Dolphins. Mistake-free football for Tannehill along with a few nicely-engineered drives, for one thing. A tremendous running game and a huge victory for the Dolphins' offensive line against the Dolphins' defensive line. The halftime adjustments for Kevin Coyle's defense and the pure dominance of the defensive line against the run. That being said, let's not start buying our plane tickets for the playoffs just yet. This team took advantage of a fairly weak Oakland team that doesn't much diverse talent. The Dolphins' still gave up too many big plays in the passing game and struggled to get to the quarterback for the second straight week. I think the Dolphins found the perfect mix of run vs. pass on offense, and that's the way they need to move the ball to take pressure off the rookie quarterback. I think the Dolphins have some talented pieces on defense but really need a handful of guys to step up for them to be great. We've seen before the Dolphins follow a poor game with a great one, only to revert back to the bad ways the next week. The Jets game in Week 3 will be a huge test in seeing if the Dolphins can carry over and build on the success they had today. If that happens, it's quite possibly this team that struggled so much in the preseason can take advantage of a week schedule and create a solid foundation to build upon in 2013.